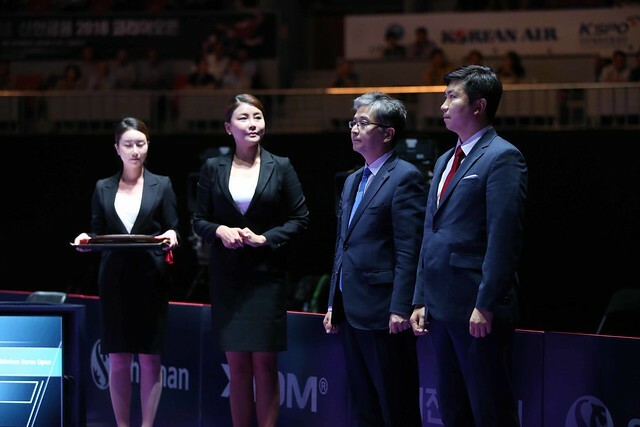 Spectators in Daejeon witnessed a breathtaking final day of play at the Seamaster 2018 ITTF World Tour Platinum Shinhan Korea Open featuring the crowning of a triple gold medallist at an ITTF World Tour event for the first time. Relive the drama from the final day at the Daejeon Hanbat Stadium with our recap of Sunday 22nd July's action. Chen Meng and Ding Ning received the first trophy of the day thanks to a superb display against Wang Manyu and Zhu Yuling in an all-China Women’s Doubles final. In a tight encounter, each game was decided by no more than a two point margin – with three of the four ends going in the favour of fourth seeds Chen Meng and Ding Ning (14-12, 9-11, 11-9, 13-11) a first title together as a pairing was secured. Then came the host nation’s first involvement of the day as Korea Republic’s Jang Woojin and Lim Jonghoon met face-to-face with Hong Kong’s Ho Kwan Kit and Wong Chun Ting: seeded sixth for the Men’s Doubles event Jang Woojin and Lim Jonghoon delivered an exceptional performance in the final with their top seeded opponents falling to a dramatic four games defeat (11-8, 19-17, 9-11, 11-9). With the two doubles tournaments drawing to a close the attention shifted to the Women’s Singles title match which featured two of China’s finest players doing battle as Chen Meng and Zhu Yuling took to the table. The top two seeded players in the category but the final outcome went against the seeding list as second seed Zhu Yuling accounted for No.1 seed Chen Meng across five games (11-4, 7-11, 11-8, 11-5, 11-9) to claim her fifth Women’s Singles gold medal on the ITTF World Tour. There was just one more fixture to be settled as Korea Republic’s Jang Woojin and China’s Liang Jingkun, both unseeded, fought it out for Men’s Singles glory. Success in the Mixed Doubles tournament with Cha Hyo Sim and in the Men’s Doubles final with Lim Jonghoon, Jang Woojin went on to become the first-ever triple Champion at an ITTF World Tour event, adding the Men’s Singles title to his collection with a commanding display against Liang Jingkun (11-8, 11-9, 11-7, 11-3).